Anyone who has read the best-selling Mama Makes Up Her Mind or listened to Bailey White's commentaries on NPR knows that she is a storyteller of inimitable wit and charm. Now, in her stunningly accomplished first novel, she introduces us to the peculiar yet lovable people who inhabit a small town in south Georgia. Meet serious, studious Roger, the peanut pathologist and unlikely love object of half the town's women. Meet Roger's ex-mother-in-law, Louise, who teams up with an ardent typographer in an attempt to attract outer-space invaders with specific combinations of letters and numbers. And meet Della, the bird artist who captivates Roger with the sensible but enigmatic notes she leaves on things she throws away at the Dumpster ("This fan works, but makes a clicking sound and will not oscillate"). 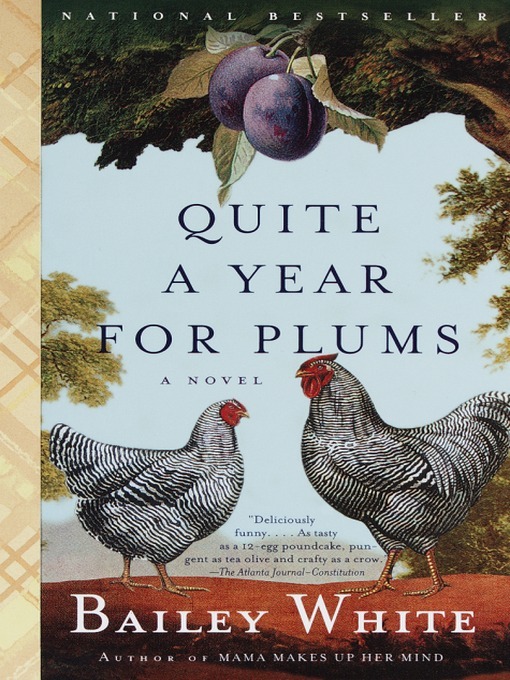 Heartbreakingly tender, often hilarious, Quite a Year for Plums is a delectable treat from a writer who has been called a national treasure.